The kneading method you use and the ingredients you buy are personal choices, and you can change those choices if you don’t like the results. But if you move to a different altitude, you’ve got to adapt. It seems that most people have problems when they move from lower altitudes to higher ones, but recently someone complained to me that her favorite buns weren’t as light and fluffy at 5000 feet as they were when she lived at over 7000 feet. So adaptation is required whether you’re moving up or down. A few hundred feet isn’t going to make a lot of difference, but when you’re looking at thousands of feet, things start to change significantly. As you climb to higher altitudes, the boiling point of water is lower, the air is thinner, and generally the air is also dryer. Two of those three things affect bread the most. It’s not the boiling water. Thin air is tough on humans because there’s less oxygen in the air we inhale. For risen doughs, though, the issue is air pressure. The bubbles inside a loaf don’t have to work as hard to grow because there’s not as much air pressure working against them. Because of that, breads and cakes and cookies rise higher and faster. There are two problems with a faster rise. First, a long, slow rise is part of what develops the flavor in yeast-risen breads. A fast rise gets your bread made faster, but it’s not going to taste quite as good. Second, if you’re relying on the time stated in a recipe, there’s a good chance your dough will over-rise and possibly collapse if you’re at high altitude. There are several ways to adapt. First, you can opt to use less yeast at higher altitudes. While this is the most common recommendation, it’s not my preferred method. I want all those happy yeasts in my bread and I want the same number of bubbles. I just want the process to slow down so flavor can develop. The best way to slow down the bread’s activity is to keep it cooler. 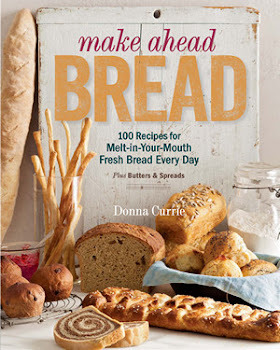 Many bread recipes advise finding a warm spot in the kitchen to let the bread rise. Some recommend placing the bread on the top of the refrigerator or inside the oven with the light on. My oven even has two proofing settings for a fast proof and a slow one. That’s fine at sea level, but at high altitude, ignore the search for the warm spot, and find a cooler spot instead. If you want to bake your bread the same day, the refrigerator might be just a bit too cold, but particularly in winter, you’ve probably got a cooler corner somewhere that your dough will appreciate. Another trick is to add colder ingredients when you make your dough. Yes, your yeast needs warm temperatures to become active, but it’s perfectly fine to proof your yeast in a small portion of the water to activate it, then add the rest of the water at a lower temperature. In fact, if I’m using liquids besides water – like milk or whey or yogurt – I add them straight from the refrigerator. A dough that over-rises on its first rise isn’t a tragedy. You simply punch it down, knead it, and continue. It might not be exactly the same as if you hadn’t let it over-rise, but it will still be fine. If your formed dough over-rises to the point of collapse just before you put it in the oven, that’s an entirely different problem. And of course, dough can collapse in the oven if it expands too much before it sets. To thwart collapsed bread, you need to make sure your gluten structure is well developed and strong enough to hold those pesky bubbles. Make sure your finished dough passes the windowpane test. For extra insurance, you can add ingredients that strengthen gluten, like ascorbic acid or vinegar. A teaspoon in a loaf of bread will be unnoticeable in terms of taste. Even if you’ve got a colder dough and good gluten development, check the dough earlier than the recipe suggests. Yeast is a quirky beast, and sometimes it simply doesn’t want to slow down. The second problem, dry air, affects the flour rather than the dough. At high altitude, flour tends to hold less moisture, and that causes a few issues. First, it affects measurements – and weights – because you’re weighing more flour and less moisture when the flour is very dry. And of course volume measures are inaccurate, no matter what. Not only are you likely to be starting with a little more flour, by weight, it’s also thirstier flour. It wants to absorb more water. As a result, doughs at high altitude tend to be drier than those at lower altitudes, even if the weights are consistent. Whether your flour at high altitude is dry enough to throw off a recipe significantly depends on a number of factors. For example, if that flour came to your grocery store yesterday from a distributor at sea level and a normal level of humidity, that flour isn’t going to dry out immediately. Storing it in a sealed container will help prevent moisture loss as well. On the other hand, if the flour was milled and stored locally, it’s already dry. Unless you have scientific equipment in your kitchen to test the flour’s water content and to test the hydration of your dough, the best you can do at high altitude is assume that the flour is slightly drier, and be ready to adjust for that if necessary.